KoopaTV: Paper Mario: Color Splash — Episode 2: Move Out! Rescue Red is colour-blind. This seems like a damning fate for someone named after the colour of his clothes. Rescue Red is a lazy jerkass who goes on hot spring breaks while his companions rescue for him. Rescue Purple is trying to stick up for the bravery of his own squad, but Rescue Red never acknowledges it. By the way, that blow-dryer is totally a Thing. I guess it's possible they're both true. Rescue Red could be a very bad squad leader that doesn't even know who is in his squad, because he can't tell the difference between colours. Then he claims to have been directing his squad and goes in a hot spring with them. 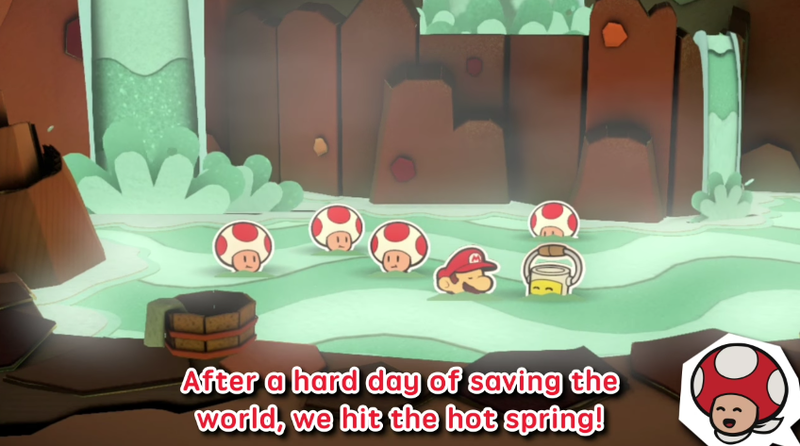 To be fair, Rescue Red himself is not presently in the hot spring. Shout-outs to Huey, by the way. 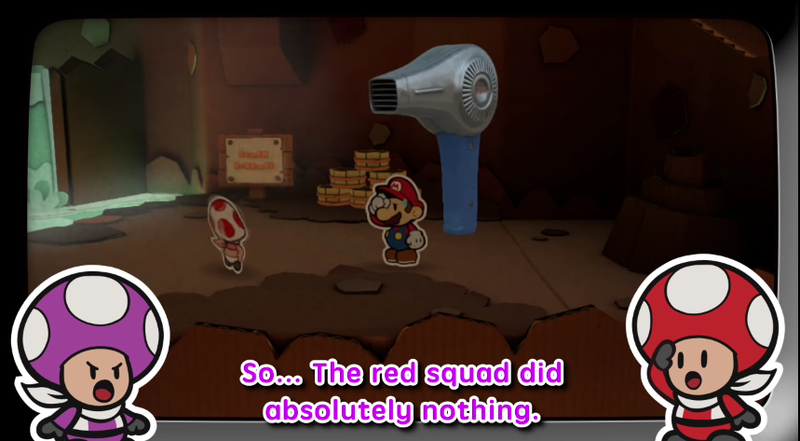 What if... what if the supposedly Purple Squad was the Red Squad all along, and Mario simply recoloured them with his Paint Hammer to confuse Rescue Purple? That would prove that Rescue Purple only knows his Toads by their colour and not the content of their vibrant, totally unique characters, and would vindicate Rescue Red. The problem with THAT theory is that Mario's Paint Hammer only has three hues of paint: Red, Yellow, and Blue. Perhaps the Toads in the hot springs are the Purple Squad painted to Red? 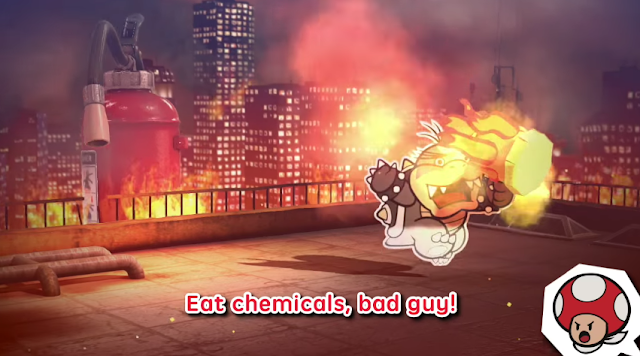 Why would Mario do that? Hell if I know. Perhaps to try to discredit the Rescue V, so they appear to be illegitimate protagonists as to undermine their attempts to take their rightful places as the game's heroes? Then again, there's no one involved here that can be counted as a hero. Has Rescue Red crossed President Barack Hussein Obama's red line in the use of chemical weapons?! Stay tuned for Episode 3: Infiltration! Secret Base of the Blue Sea! Word on the road says it'll feature Rescue Blue. Meanwhile, Ludwig's going to take a long nap this weekend. Episode 3 is here already, and it's a lot more important than Episode 2. It features the author! "and vindicate would Rescue Red"
I think either the words are in the wrong order, or Yoda edited that part. Rescue V is still the best thing I've seen from Color Splash and the one that gives me hope. But good that you're seeing some kind of light. I'm still going to wait for reviews, though.